I love making leftovers into another meal; it’s genuinely satisfying to take something which you’ve had for one, two, three nights in a row and reinvent it into something that excites you again. And, after two nights of pork and beer stew, I was ready for a change. There was about one large serving of stew left in the pot, but I needed to feed my husband and myself so I had to think of something to add which would bulk it out and add a bit of interest. Eggs, of course! Having been the gleeful recipient of some farm fresh eggs that week at work, they were the perfect addition to my rejigged pork stew. I wanted to change the flavor as much as possible, so I decided to make a huevos rancheros-style dish with a spicy Mexican vibe. 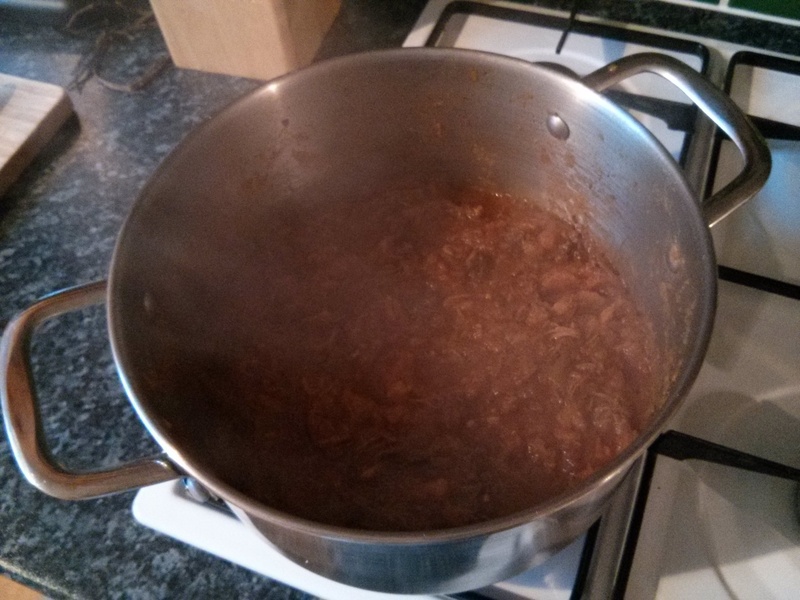 To the stew I added liberal amounts of ground cumin, ground coriander, chilli powder and paprika. Had I had a fresh chilli I would have chopped that and thrown it in, but as it was I used a heaped teaspoon of chilli pesto which gave a lovely fiery kick to the sauce. 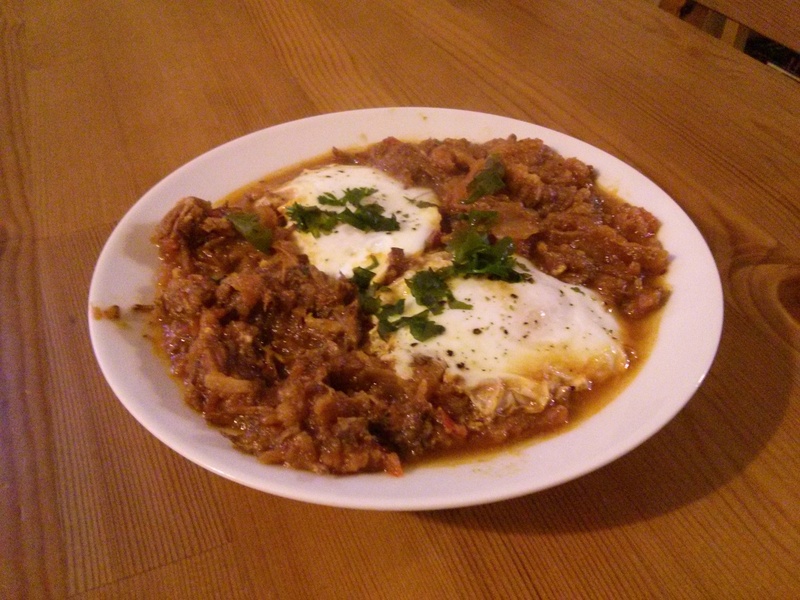 The newly spiced stew, vegetables mashed and chunks of meat shredded, acted as the tomato-chilli sauce which normally accompanies the eggs in huevos rancheros and, rather than frying the eggs and serving them on corn tortillas, I decided to bake the eggs in the bubbling stew. Tortillas would have been a welcome mop, but sadly I didn’t have any. 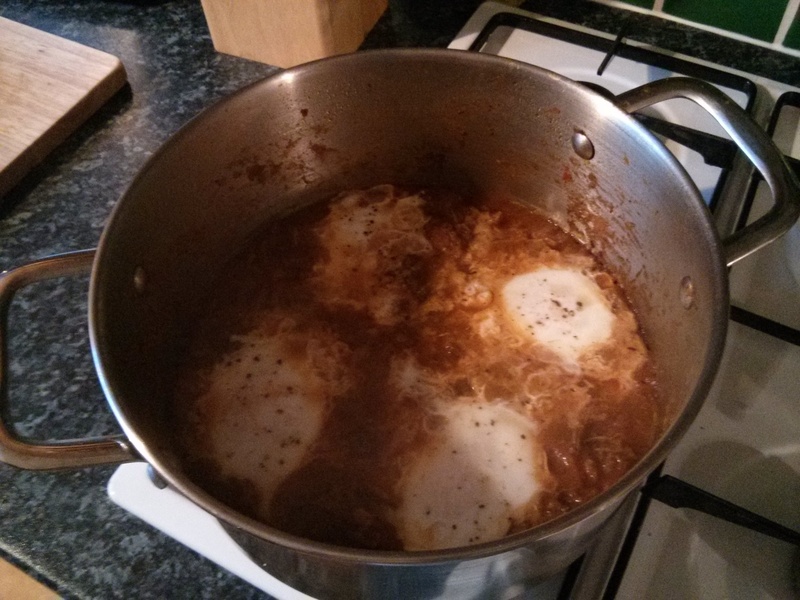 I made a couple pockets in the stew and dropped the eggs in, salting and peppering each one. 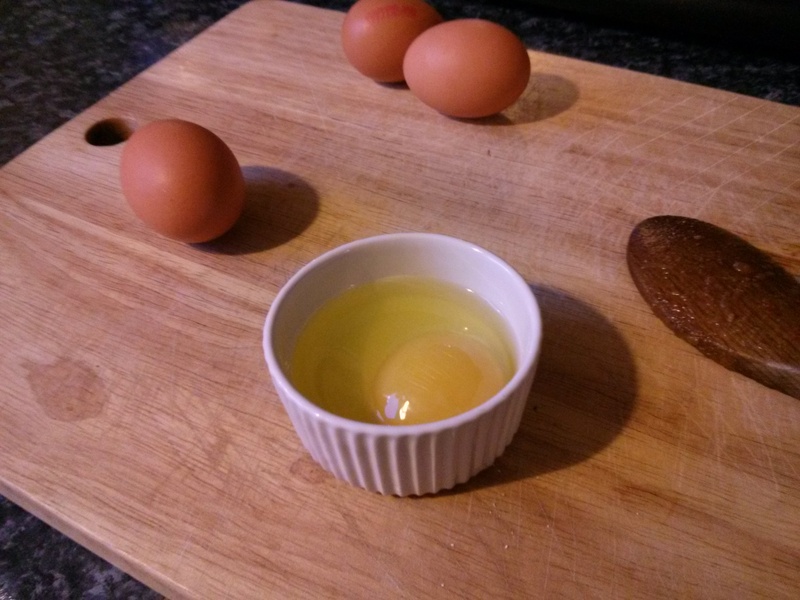 Then on went the lid and in three or four minutes the eggs were just done, maintaining that all important runny yoke. With a generous sprinkling of cilantro (coriander) we were ready to rock! With just a few spices and some chilli the pork stew transformed from a neverending, Groundhog Day-esque pot of muck to a spicy, warming plate of baked eggs to brighten up our Monday night. I love what you did with this leftover pork! (though I also liked as a stew in the previous post), and I do think it is alot of fun to make something new with leftovers! Well, fingers crossed for the mother’s day meal this Sunday. Who knows? I might be able to create something even better out of the leftovers from that! Thanks for your help with that by the way. Thanks! Sometimes the best meals start from a bunch of unexciting stuff thrown together in a state of dinnertime panic! You should definitely try it! Thanks! I’m really enjoying looking at your blog, you must do nothing but cook beautiful things with all the recipes you post. I’m so jealous!